Warren Lee Fought, age 83, passed away, December 19, 2018. He attended Holland Public Schools and graduated from Holland High School. Mr. Fought served his country honorably in the United States Army. 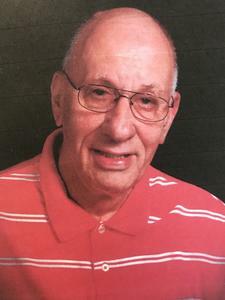 Warren worked for the Louis Padnos Iron & Metal Company for 37 years. After retirement he worked at Meijer as a greeter. He was a longtime faithful member of Harlem Reformed Church serving as a Cadet counselor. Mr. Fought was also active in Bible studies. He was preceded in death by his parents, Leonard and Rolene Fought. Warren is survived by his wife, Patricia; son, Daryl (Margi) Fought; grandchildren, Benjamin, Matthew; brother, Ken (Barb) Fought; sister, Margaret Kamps; many friends and extended Family. Visitation will be 5-8:00pm, Friday, December 21, at Harlem Reformed Church, 6854 144th Ave, Holland, MI. A funeral ceremony will be held 11:00am, Saturday, December 22, at Harlem Reformed Church. Military Honors will be rendered by the United States Army Honor Guard. Pastor John Nyitray & Pastor Bryan Kunz officiating. Interment in Restlawn Memorial Gardens. Memorial Contributions can be made to Harlem Reformed Church, 6854 144th Ave Holland, MI 49424 or to Hospice of Holland, 270 Hoover Blvd, Holland, MI 49423. Professional services are entrusted to the Dykstra Funeral Home – Northwood Chapel.